Grate zucchini, parsnip, and onion in a food processor. Remove any large un-grated pieces and chop finely. Transfer into a large bowl. Add kosher salt, pepper, arrowroot starch, white rice flour. Stir well to combine. Add sparkling water and mix again until mixture feels mushy. Set a heavy bottomed stainless steel (for even heat) saute pan on high heat. Add about 1/2 inch high of oil to the pan. 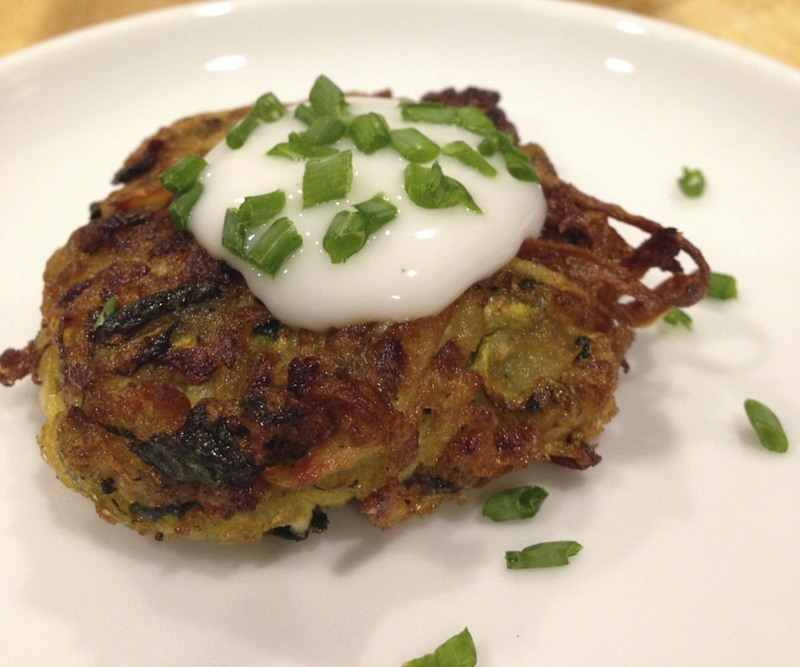 Note: To get your latkes crispy – without being greasy - heat your oil to 350 degrees F using a candy thermometer or wait until the oil appears thin and watery. Grab a handful of the mixture and squeeze liquid between your hands as you squeeze into a ball like shape. Place into the hot oil. Do not press down at this point because it could fall apart. It will flatten when you flip it over. Preheat oven to 350 degrees F, if serving the same day. Transfer onto a stainless steel cooling rack (an oven safe cooling rack) set over a baking sheet. If your cooling rack is not oven safe, transfer onto parchment lined baking sheet instead. Then put into a freezer safe airtight container with a layer of parchment or waxed paper between layers and freeze. 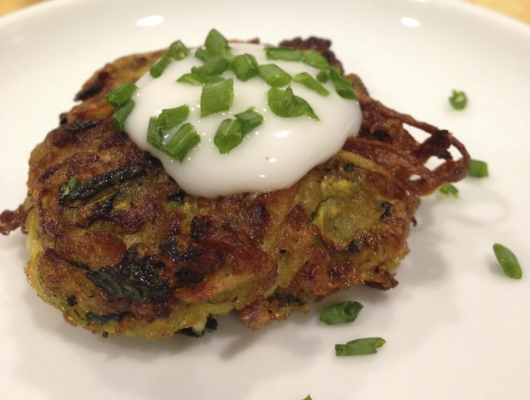 Chanukah is all about latkes and doughnuts when it comes to food. Here is a gluten free, dairy free, egg free recipe that tastes just as delicious without the traditional use of egg and crispy as ever! You can substitute the flours for chestnut flour to make it Paleo.